We have been pondering this thing for several hours straight. We're still at sea. So there's this pig, right? And he's on a table? With, like, a checkerboard pattern covering his skin. Is the pig a ghost? Are we seeing through him? Is his transparency a metaphor, meant to imply that he never had any weight before he was killed, never made any demands on our consciences? 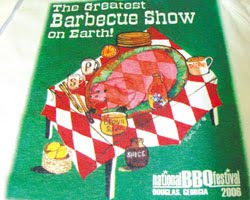 Was the pig run over by a truck with tires bearing a tread in the same design as the tablecloth? Is the pig a chameleon-pig hybrid attempting a bit of closing-the-barn-doors-after-the-horses-have-gone-out camouflage? Or, you know what? 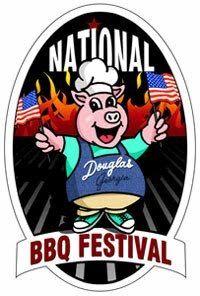 Let's just stick with this little cartoon, also from the National BBQ Festival in Douglas, Georgia. It's a flag-waving, smile-grinning, fire-ignoring good time!